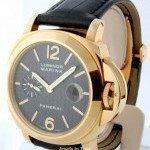 Case material: Rose gold; Charge: Automatic; Conditions: Never worn Presentation condition : Without documents; Place: Usa, Boca Raton Model: Luminor Marina Price on request Jewels in Time Reference: Pam00140 Near mint preowned mens Panerai 140 is a limited edition(one of 300 made) model in solid gold. Comes with its box and papers, tool and extra strap as shown. H serial number(2005). Case material: Steel; Charge: Manual; Conditions: Never worn Presentation condition : Without documents; Place: Usa, New York Model: Luminor 1950 8 Days Chrono Mon $ 10225 Element iN Time Reference: nessuna This Watch Is New Un-Worn With Original Box And Papers. 44mm Brushed Stainless Steel Case With A Transparent Case Back. Polished Stainless Steel Bezel. 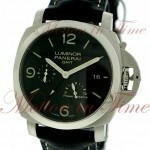 Black Sandwich Dial With Luminous Arabic Numeral And Index Hour Markers. 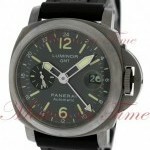 Officine Panerai Black Rubber Strap. Water Resistant To 100 Meters. 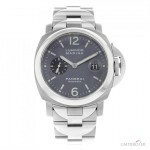 Officine Panerai Caliber P.2002 Manual-Wind Movement With An Approximate Power Reserve Of 8 Days When Fully Wound. This Watch Features A Date, Second TIme Zone, Power Reserve Indicator, Am/Pm Indicator As Well As A Seconds Reset Function. 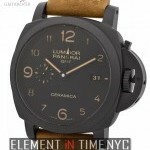 Case material: Ceramic; Charge: Automatic; Conditions: Never worn Presentation condition : Without documents; Place: Usa, New York Model: Luminor Marina 1950 3 Days Aut $ 9925 Element iN Time Reference: nessuna This Watch Is New Un-Worn With Original Box And Papers. 44mm Black Ceramic Case With A Fixed Black Ceramic Bezel. Gorgeous Smoked Transparent Sapphire Crystal Case Back. 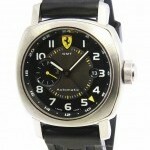 Black Sandwich Dial With Tan Arabic Numeral Hour Markers. The Arabic Numerals And Hands Are Luminous. 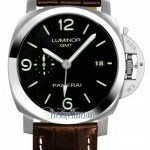 Officine Panerai Brown Assolutamente Leather Strap. 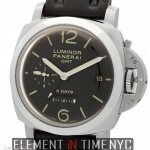 Officine Panerai Matte Titanium Tang Buckle With A Special Hard Black Coating. 2.3mm Thick Sapphire Crystal. Water Resistant To 100 Meters. 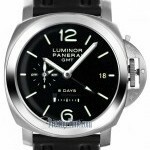 This Watch Features A Small Seconds Sub-Dial, Date Aperture, Seconds Reset Function, GMT Function As Well As A Power Reserve Indicator On The Back Of The Watch. Officine Panerai Caliber P.9001 In-House Movement With A Total Of 229 Parts Including 29 Jewels. An Approximate Power Reserve Of 3 Days When Fully Wound. Case material: Rose gold; Charge: Manual; Conditions: Never worn Presentation condition : Without documents; Place: Usa, New York Model: Luminor Marina 8 Days $ 17205 Element iN Time Reference: nessuna This Watch Is New Un-Worn With Original Box And Papers. 44mm 18k Rose Gold Case With A Transparent Case Back. 18k Rose Gold Fixed Bezel. Brown Sandwich Dial With Luminous Arabic Numeral And Index Hour Markers. 2.5mm Thick Sapphire Crystal. Water Resistant To 300 Meters. 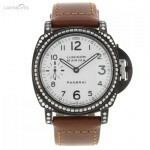 Officine Panerai Brown Alligator Skin Strap. 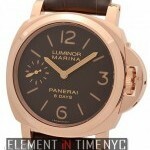 Officine Panerai 18k Rose Gold Tang Buckle. Officine Panerai Caliber P.5000 Manual-Wind Movement With 21 Jewels And An Approximate Power Reserve Of 8 Days When Fully Wound. This Watch Features A Sub-Seconds Sub-Dial At The 9 O'Clock Position.